zoitz » Blog Archive » You want to fly, eh? NO. Hint: when was the last time you saw a penguin flying? good comic. this seems like one of those that you don’t realize how well-made the concept is until after it’s in front of you. Last time i saw penguin flying on an footage taken by BBC 😉 ??? Is this ment to be a Windows/linux joke? 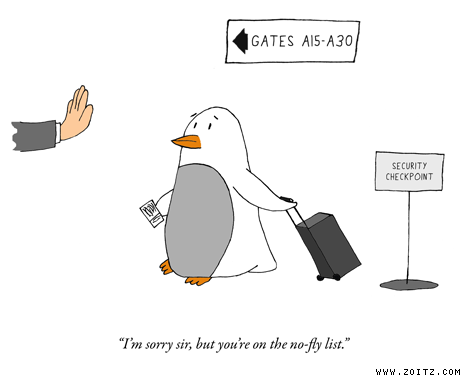 For those of you too thick to get the joke, penguins are unable to fly, thus the airline attendant is telling him he can’t board the plane because he’s on the “no-fly list”. I woulda assumed that the comic is about Windows and Linux. “Gates” 15-30, and a linux penguin. *sigh*, it is not that we dont get it without ur kind explanation. It is that it is just not funny. The joke could as well have been two words. Penguin. Airport. If you don’t think this is funny…you have severe emotional problems – for which the only cure is to go away and never talk to other humans again. This comic is superb! Can we has another? To the people who have no sense of humour, this kind of comic is the sophisticated and witty kind of humour, not “Oh, he’s bashing linux and windows ha ha.” kind of lame humour. A Linux penguin? For all you inter-nerds out there who think that Linux is superior, not all penguins are mascots for Linux. Let it go. Viva la Windows. Saw one of these posted on 4chan and thought it was hilarious. Wish you would update more.